You’d be hard pressed to find anyone more devoted than I am to GarageBand in both its Mac OS and iOS forms. For musicians (and those who want to play at being musicians for a few minutes or hours), they’re remarkable applications. But the iOS version has always lacked something its Mac-based sibling has had from the get-go—the ability to edit your work. With GarageBand 1.2, that sour note has been corrected. 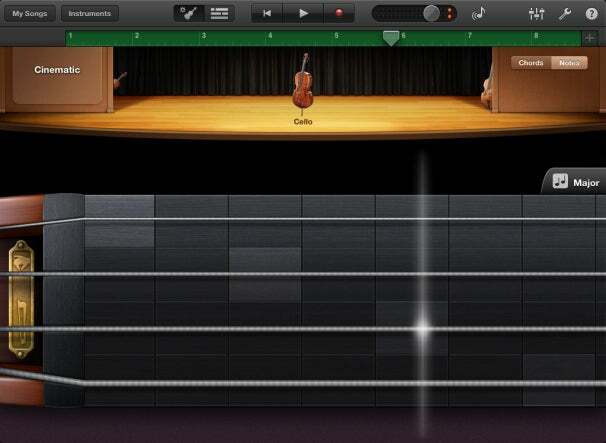 Additionally, the latest version of GarageBand adds a new Smart Strings instrument, track merging, a broader variety of sharing options, iCloud song sync, and, most intriguing of all, Jam Session, a feature that allows up to four players using four separate compatible iOS devices to record a song together. With GarageBand 1.2, awesome gets kicked up to 11. By way of background, digital audio workstation (DAW) applications that record input from music keyboard controllers are like word processor applications in that they allow you to correct mistakes. If you’ve hit the wrong note, played a note at the wrong time, or banged on a note with too much force, you have the ability to edit what you’ve done—delete or move notes, shift notes forward or back in time, as well as increase notes’ velocity (which translates to louder or software volume along with a change in the sound’s character or timbre). Additionally, if you’ve missed a note altogether (or would like to cheat by adding a string of them that you couldn't possibly play by hand), you can simply add the notes you want. All this could be done in the OS X version of GarageBand but not the iOS version—until now. To edit a note in GarageBand 1.2, simply double tap on the note in a software instrument track (meaning a track that uses GarageBand’s internal sounds rather than a track recorded using a microphone or external instrument such as a guitar) and a series of commands appears, as it did in the past. New to this series is the Edit command. 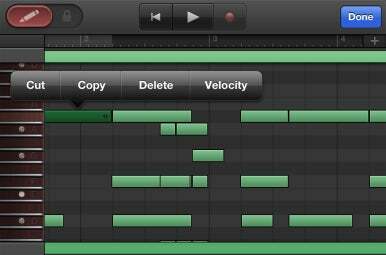 Tap it and you see a “piano roll” view (rectangles on a grid that represent notes) of the track’s pitches. To move a pitch elsewhere, just drag it. As you do, GarageBand will play the pitch associated with its current position—so, drag it up from C to E and you’ll hear C, C#, D, and E as you move the note over these pitches. To increase or decrease a note’s duration, tap to select the note and drag on its right side to lengthen or shorten it. To change its velocity, tap on it and tap Velocity in the series of buttons that appears. When you do, a slider appears, which you use to alter its velocity. As you drag the slider, the note plays at the velocity shown on the slider—getting softer as you drag the slider to the left and louder as you drag to the right. Notable Addition: You can now edit notes in GarageBand on the iPad and (in this case) the iPhone. You don’t have to work on a note-by-note basis. Drag diagonally over a group of notes and you can move, change the duration, or change the velocity of all of them at once by adjusting any one of the notes. When you change notes' velocities, they scale accordingly—meaning that if the first three notes were quiet and the next three a bit louder, their loudness relationship doesn’t change. Overall the notes will be louder or softer but the first three notes will still be quieter than the last three. It’s within this Edit view that you add and delete notes. To delete a note, tap and hold on the red pencil icon in the top-left corner of the screen and then tap on the offending note. It disappears. To add a note, just tap somewhere that doesn’t currently have a note. If you find it clumsy to hold down the pencil button while tapping on notes or areas within the grid, toggle the pencil icon to the right to lock it so that you don’t have to hold it. GarageBand’s creators made an interesting design decision regarding the edit view—one that I’m not entirely comfortable with. If you’re editing a keyboard track, you see a keyboard along the left side of the screen that indicates the pitches to the right. So, for example, any pitches that appear on the same line as C3 will play the corresponding C pitch. I’m a keyboard player so this view is perfect for me, but wouldn’t necessarily be for drummers or guitar players who are unfamiliar with a piano keyboard. If, however, you’re editing a guitar track, you see a guitar fretboard on the left side of the screen. I’m not a guitar player, so I don’t understand the relationship between these frets and the notes next to them. The note’s pitches are printed on the fretboard, but that printing tends to blend in with the background and can be hard to see. I’d love the option to display any instrument layout I like along the side of the edit screen. I will say, however, that I very much appreciate that when editing drums, you see a picture of each drum or cymbal on the left side of the screen, making it very easy to find the sound you seek. Additionally, regardless of the instrument you’re editing, you can preview notes by tapping on the representation of the instrument on the screen’s left side. Adding to this screen’s nitpicks, I wish it contained a Solo button that allowed me to hear just the track I’m editing. When adding or adjusting tracks, it’s nice to hear what you’ve done without listening to other tracks. Yes, you can return to the tracks view to solo the track and then move back to the edit screen, but that Solo button within the edit screen would save you the trip. Given the size of the iPad’s screen versus that of the iPhone and iPod touch, it should come as no surprise that it’s easier to edit on the iPad—its roominess makes a difference when selecting and adjusting notes. When you first open an editing screen, GarageBand shows you approximately four bars of music. On the iPad, you’ll see the majority of notes you played within these measures—though high and low pitches may not be in view. The iPhone/iPod touch version doesn’t show you nearly as many pitches, and for good reason: The layout would be much too cramped. But it does mean that you’re going to scroll more with the smaller implementation of the app. However, with either version, you can zoom in and out using the pinch gesture. How is note editing on an iOS device? Not bad, particularly when you consider that your past alternative was to rerecord a track because of one or more badly played notes. This one feature makes the mobile version of GarageBand a far more useful tool. 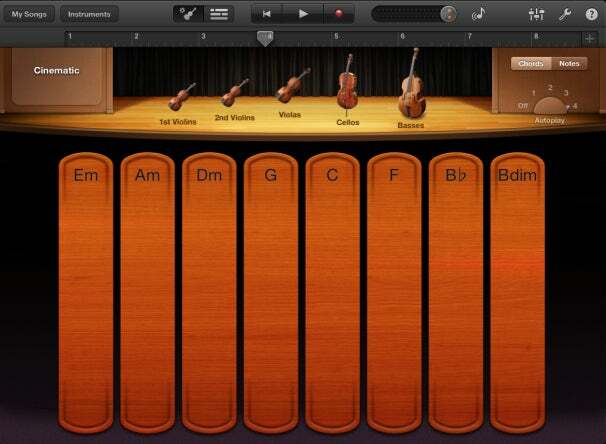 With this version, GarageBand adds another smart instrument—Smart Strings. As with many other smart instruments, this one lets you play chords and individual notes as well as play prerecorded patterns that fit a particular style and time signature. But this smart instrument has a bit more going on because of the variety of instruments that make up the bowed string family as well as the many ways you can play them. When you first call up the Smart String instrument, you see a fingerboard that represents the diatonic chords of the key you’ve chosen (so, for the key of C, C major, D minor, E minor, F major, G major, A minor, B diminished, and Bb major thrown in for good measure). Above are five instruments that make up the string section—1st Violins, 2nd Violins, Violas, Cellos, and Basses. You can “turn off” (not include) instruments within the section simply by tapping on them. When you do, their sound won’t be part of whatever you play. Strung Together: Here’s how the new Smart Strings instrument looks on an iPad. In this view you can produce sound from the fingerboard in three different ways. If you tap on the fingerboard you hear a pizzicato chord (or single note if you’ve disabled all but one instrument). This is the sound of plucked strings on the instruments. If you swipe up or down quickly you hear an “arco” sound—one where the players sharply bow their instruments one time. If you tap and drag on a chord, the group plays legato—a chord or note plays until you stop “bowing.” If you “bow” slowly, the sound is quiet. Bow more quickly and the volume increases. And if you bow one chord and then start slowly bowing on another, the common notes of the first chord (E and G, for example, if you’re moving from C major to E minor) will smoothly crossfade to the new chord. The voicing of the chord depends on where you tap on the fingerboard. Tap low and you hear a low voicing. Tap high and you hear higher notes. There are four voice positions on the fingerboard for each chord. You can also play notes on a selected instrument by tapping on the Notes button. When you do, a fingerboard appears. To play a note (or multiple notes), just tap on the strings. Tap and hold, and the string will continue to play until you lift your finger. Shift your finger to the right or left and the pitch goes sharp or flat. String players who are reading along are, at this very moment, saying, “Tap and hold on a string and it keeps playing? Does Apple think we have infinitely long bows?” And they’re right, when you bow back and forth on one of these instruments, you don't hear one long steady pitch. There's some variation. But Apple’s got you covered. At the top of the fingerboard is a pizzicato/bow button. When you tap and hold on it and then tap on a string, that string plays pizzicato. Tap and hold on the button and then swipe up and down on a string and you bow it. (You can bow only one note at a time.) As with the Smart Strings’ chords, the faster you “bow” the louder the sound. If you’d like to bow throughout the track, simply double-tap on this button to lock it. Unlike with playing individual strings by tapping on them, in this bowed mode you don’t have the option to “play in the cracks” (play the tones between half-step pitches). You can play only the chromatic pitches. Bow Finger: Swipe your finger up and down to bow notes. 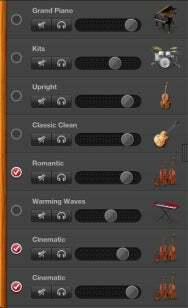 When editing these stringed instrument tracks, you find you have an additional option. Tap on a note within a string track, and a More button appears next to the Velocity button. Tap it, and you see two new buttons—Instrument and Articulation. Tap Instrument, and you can choose which instrument will play that note. 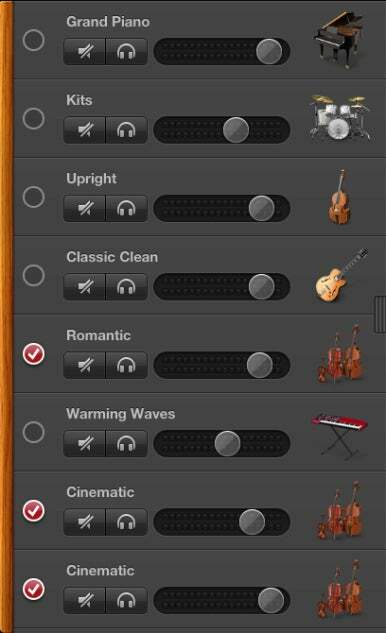 For example, tap a high note, and you can choose 1st Violin, 2nd Violin, Viola, or Cello. Tap a low note, and your options are Viola, Cello, and Bass. You don’t have the option to assign a note to an instrument if that note is wildly out of that instrument’s range. When you tap Articulations, you can choose how that note is played—Legato (drawn out), Staccato (played with a short brisk scrape of the bow), or Pizzicato (plucked). You can even get these articulations when playing an iPad’s Smart Strings instrument with an external music keyboard connected through Apple’s $29 iPad Camera Connection Kit ( ). In this case, move the keyboard’s modulation wheel all the way to the bottom and you’ll play a legato sound. Move the wheel to the half-way point and you play staccato notes. Push the wheel all the way up and the stings play pizzicato. I wasn’t briefed on this feature—I just happened to stumble upon it. And yes, it made me smile. It’s very clever and shows a thoughtfulness for those musicians who prefer to play GarageBand with an external keyboard. Here’s an example of strings in action. This song snippet—which features piano, bass, guitar, and drums in the first eight bars, followed by eight bars of three string tracks added to the those instruments, and then just eight bars of strings—demonstrates how strings can sweeten a track. The prerecorded patterns sound great. For individual instruments played solo, I prefer the sound of the lower strings. When you move into single note, bowing on the viola and violin instruments the notes can be a little boxy and over-rosined sounding—the kind of sound you might hear playing the instrument, but a timbre that's not typical from a listener's perspective. Merge Ahead: The selected Smart Strings tracks will be merged to a single track. The iOS version of GarageBand has always been limited to eight tracks, and this version is no different. However, taking a cue from How They Did It In The Old Days, GarageBand 1.2 allows you to pack in far more tracks. It does this by adding a Tracks Merge feature. In those old days of two and four-track recorders, if you wanted to add additional tracks you’d have to “bounce” the already-recorded-and-mixed tracks to a single track, thus combining those tracks into one. This would free up those tracks so you could use them for new material. GarageBand 1.2 does something similar.